What Are the Most Common Financial Modeling Interview Questions? In this Financial Modeling Interview guide, we’ve compiled a list of the most common and frequently asked financial modeling interview questions. This guide is perfect for anyone interviewing for a financial analyst jobGuide to Becoming a Financial AnalystHow to become a financial analyst. Follow CFI's guide on becoming a financial analyst - networking, resume, interviews, financial modeling skills and more. We've seen thousands of people become financial analysts over the years and know precisely what it takes. or any other role requiring knowledge in the field as it helps you prepare for the most critical questions relating to financial modeling concepts and application. Alongside with this comprehensive guide to financial modeling interview questions (and answers), you may also be interested in exploring “The Analyst TrifectaThe Analyst Trifecta® GuideThe ultimate guide on how to be a world-class financial analyst. Do you want to be a world-class financial analyst? Are you looking to follow industry-leading best practices and stand out from the crowd? Our process, called The Analyst Trifecta® consists of analytics, presentation & soft skills“ — CFI’s guide on how to be a great financial analyst. This guide focuses exclusively on technical financial modeling interview questions, especially the fundamental knowledge of building financial models using software such as Excel. 1. What is financial modeling? What is a financial model used for? A financial model is simply a tool that’s usually built in Excel to forecast, or project, a business’ financial performance into the future. The forecast is typically based on the company’s historical performance and requires preparing an income statementIncome StatementThe Income Statement (or Statement of Profit and Loss) shows performance from operations of a business. The financial statement begins with revenues and, balance sheetBalance SheetThe balance sheet is one of the three fundamental financial statements. These statements are key to both financial modeling and accounting. The balance sheet displays the company’s total assets, and how these assets are financed, through either debt or equity. Assets = Liabilities + Equity, cash flow statement,Cash Flow Statement​A Cash Flow Statement (officially called the Statement of Cash Flows) contains information on how much cash a company has generated and used during a given period. It contains 3 sections: cash from operations, cash from investing and cash from financing. and supporting schedules (known as a “three statement model”). From there, more advanced types of modelsTypes of Financial ModelsThe most common types of financial models include: 3 statement model, DCF model, M&A model, LBO model, budget model. Discover the top 10 types of Excel models in this detailed guide, including images and examples of each. Financial modeling is performed for many reasons including to value a business, raise money can be built, such as discounted cash flow analysisWalk me through a DCFThe question, walk me Through a DCF analysis is common in investment banking interviews. Learn how to ace the question with CFI's detailed answer guide. Build a 5-year forecast of unlevered free cash flow, calculate a terminal value, and discount all those cash flows to present value using WACC. (DCF model), leveraged-buyoutLeveraged Buyout (LBO)A leveraged buyout (LBO) is a transaction where a business is acquired using debt as the main source of consideration. An LBO transaction typically occur when a private equity (PE) firm borrows as much as they can from a variety of lenders (up to 70-80% of the purchase price) to achieve an internal rate return IRR >20%, mergers and acquisitionsFinancial Modeling M&A, and sensitivity analysisWhat is Sensitivity Analysis?Sensitivity Analysis is a tool used in financial modeling to analyze how the different values for a set of independent variables affect a dependent variable under certain specific conditions. Sensitivity Analysis is performed in Excel to asses risks, measure potential outcomes, and plan for an uncertain future. 2. How do you build a financial model? Building a financial model begins with collecting information from financial statementsThree Financial StatementsThe three financial statements are the income statement, the balance sheet, and the statement of cash flows. These three core statements are intricately linked to each other and this guide will explain how they all fit together. By following the steps below you'll be able to connect the three statements on your own. for the past three years or more and calculating items such as revenue growth rate, gross margins, accounts payable daysAccounts Payable Turnover RatioThe accounts payable turnover ratio, also known as the payables turnover or the creditors turnover ratio, is a liquidity ratio that measures how many times a company pays its creditors over an accounting period. The accounts payable turnover ratio is a measure of short-term liquidity, with a higher turnover ratio, inventory days,Days Sales in Inventory (DSI)Days sales in inventory(SDI) indicates how many days it takes to sell or convert a company’s current stock into sales during a given period. Formula and accounts receivable daysAccounts Receivable Turnover RatioThe accounts receivable turnover ratio, also known as the debtor’s turnover ratio, is an efficiency ratio that measures how efficiently a company is using its assets. The accounts receivable turnover ratio measures the number of times over a period that a company collects its average accounts receivable. Formula for. These metrics are then used in combination with the financial analyst’s insights to lay out the assumptions for the forecast period as hard-codes. With the forecast assumptions in place, you can build the income statement, starting from revenue, COGSCost of Goods Sold (COGS)Cost of Goods Sold (COGS) measures the “direct cost” incurred in the production of any goods or services. It includes material cost, direct labor cost, and direct factory overheads, and is directly proportional to revenue. As revenue increases, more resources are required to produce the goods or service. COGS is often, all the way down to EBITDAEBITDAEBITDA or Earnings Before Interest, Tax, Depreciation, Amortization is a company's profits before any of these net deductions are made. EBITDA focuses on the operating decisions of a business because it looks at the business’ profitability from core operations before the impact of capital structure. Formula, examples. The balance sheet is the next thing to build. Using the assumptions such as AR days, AP days, and inventory days, balance sheet items like accounts receivable and inventory can be forecast into the future. Before completing the income statement and balance sheet, you need to create a schedule for capital assets such as Property, Plant & Equipment (PP&E)PP&E (Property, Plant and Equipment)PP&E (Property, Plant, and Equipment) is one of the core non-current assets found on the balance sheet. PP&E is impacted by Capex, Depreciation and Acquisitions/Dispositions of fixed assets. These assets play a key part in the financial planning and analysis of a company’s operations and future expenditures as well as for debt and interest. On the income statement, link depreciationDepreciation ExpenseDepreciation expense is used to reduce the value of plant, property, and equipment to match its use, and wear and tear over time. Depreciation expense is used to better match the expense of a long-term asset to the revenue it generates. to the PP&E schedule and interest to the debt schedule. You can then finish up the income statement by calculating the earnings before taxes, taxes, and net income. On the balance sheet, link the closing PP&E balance and closing debt balance from the supporting schedules. Shareholder’s equity is computed by adding net income and capital raised, and subtracting dividends or shares repurchased from last year’s closing balance. Upon completing the income statement and balance sheet, you can build the cash flow statement using the reconciliation methodFCFF vs FCFE ReconciliationFree Cash Flow to the Firm (FCFF) is the cash flow available to all the firm’s suppliers of capital once the firm pays all operating and investing expenditures needed to sustain the firm’s existence. Download CFI's free Excel template reconciling FCFF vs FCFE for a cmpany. Operating cash flowOperating Cash FlowOperating Cash Flow (OCF) is the amount of cash generated by the regular operating activities of a business in a specific time period. The operating cash flow formula is net income (form the bottom of the income statement), plus any non-cash items, plus adjustments for changes in working capital is calculated by taking net income, adding depreciation, and adjusting for changes in non-cash working capital. Investing cash flowCash Flow from Investing ActivitiesCash Flow from Investing Activities is the section of a company's cash flow statement that displays how much money has been used in (or generated from) making investments in a specific time period. Investing activities include purchases of long-term assets, acquisitions of businesses, and investments in marketable securities is a function of capital expenditures in the PP&E schedule, and financing cash flowCash Flow from Financing ActivitiesCash Flow from Financing Activities is the net amount of funding a company generates in a given time period, used to finance its business. Finance activities include the issuance and repayment of equity, payment of dividends, issuance and repayment of debt and capital lease obligations consists of all cash inflows and outflows due to changes in debt and equity. Discounted Cash Flow (DCF)Walk me through a DCFThe question, walk me Through a DCF analysis is common in investment banking interviews. Learn how to ace the question with CFI's detailed answer guide. Build a 5-year forecast of unlevered free cash flow, calculate a terminal value, and discount all those cash flows to present value using WACC. analysis is a method of business valuation. It is done by calculating the free cash flowsFree Cash Flow (FCF)Free Cash Flow (FCF) measures a company’s ability to produce what investors care most about: cash that's available be distributed in a discretionary way and discounting them back to today at the firm’s cost of capitalCost of CapitalCost of capital is the minimum rate of return that a business must earn before generating value. Before a business can turn a profit, it must at least generate sufficient income to cover the cost of the capital it uses to fund its operations. Cost of capital consists of both the cost of debt and the cost of equity (or required rate of return). You can then compute the net present value (NPV)Net Present Value (NPV)Net Present Value (NPV) is the value of all future cash flows (positive and negative) over the entire life of an investment discounted to the present. NPV analysis is a form of intrinsic valuation and is used extensively across finance and accounting for determining the value of a business, investment security, of the firm. Once the DCF analysis is completed, you can incorporate sensitivity analysis and scenarios to assess the impact on the value of the company that results from changing different variables. These are good ways to assess the risk of an investment. Presenting results of financial analysis using visual components such as charts and graphs helps executives and management better interpret financial results and identify trends quickly. It is important to stress test extreme scenarios to see if the financial model behaves as expected. Financial analysts should also audit the model using tools in Excel. 3. Name three of the most common financial modeling best practices. By following the industry best practices in financial modeling, financial analysts can build financial models more efficiently and users are able to easily and quickly grasp important information when they look at the models. Clearly distinguish between inputs (assumptions) and outputs (calculations or formulas) using formatting conventions — blue font for inputs and black font for formulas, shading, borders, etc. It is critical to structure a financial model in a logical, easy-to-follow design. This can be achieved by building the entire model on a single worksheet and using the group function to create sections. It is also a good practice to use the same color theme throughout the whole model to make it professional-looking. 4. Pick a type of financial model and walk me through the process. Pick a model which allows you to demonstrate some advanced financial modeling knowledge, but don’t be too ambitious so that you end up picking one which you are not familiar with. Make sure you know all the key steps to building the model thoroughly. It is also a good idea to build a couple of models ahead of the interview, so that they’ll be handy to show and demonstrate the process to the interviewer when this type of question is asked. 5. How would you forecast revenues? There are two approaches to model building — making your model realistic, or keeping it simple and robust. The first principles approach identifies various methods to model revenues with high degrees of detail and precision. There are also industry-specific considerations that need to be taken into account. For instance, when forecasting revenue for the retail industry, you forecast expansion rate and derive income per square meter. When forecasting revenue for the telecommunications industry, you predict the market size and use current market share and competitor analysis. When forecasting revenue for service industries, you estimate the headcount and use the income for employee trends. On the other hand, the quick and simple approach to robust models outlines how you can model revenues in a much more straightforward way, with the benefit that the model will be more simple and easy to use. In this approach, you predict the future growth rate based on historical figures and trends. 6. Tell me the difference between NPV and XNPV functions in Excel. The NPV functionNPV FunctionThe NPV Function is categorized under Financial functions. It will calculate the Net Present Value (NPV) for periodic cash flows. The NPV will be calculated for an investment by using a discount rate and series of future cash flow. 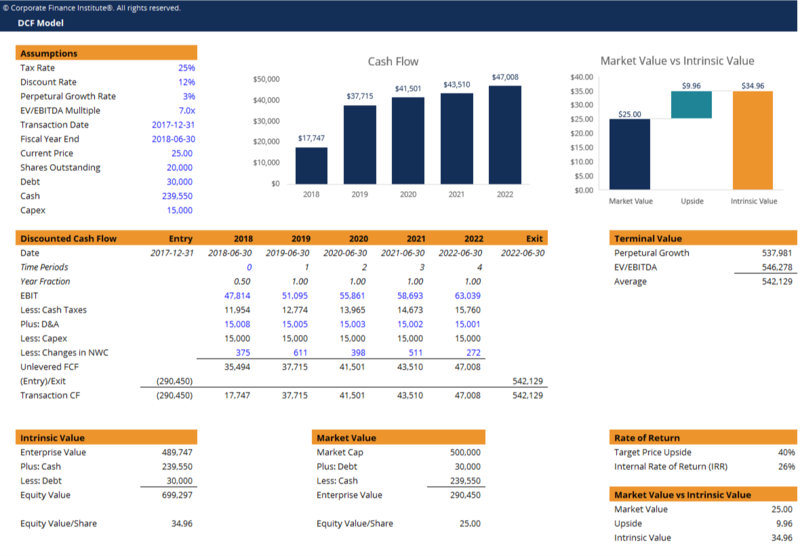 In financial modeling, the NPV function is useful in determining the value of a business calculates the net present value,Net Present Value (NPV)Net Present Value (NPV) is the value of all future cash flows (positive and negative) over the entire life of an investment discounted to the present. NPV analysis is a form of intrinsic valuation and is used extensively across finance and accounting for determining the value of a business, investment security, given a series of cash flows and a discount rate. The NPV function assumes that payments are spaced out in equal periodic payments. The function argument is =NPV(rate, [value 1], [value 2],…), where rate is the rate of discount over the length of the period, and value 1, value 2,… are numeric values that represent a series of payments and income. The XNPV functionXNPV Function in ExcelThe XNPV function in Excel should be used over the regular NPV function in financial modeling and valuation analysis to ensure precision and accuracy. The XNPV formula uses specific dates that correspond to each cash flow being discounted in the series. Learn step by step in this guide with examples and sceenshots is far more precise than the NPV function because it takes into account the specific dates on which each of the cash flows takes place. This function requires the input of a discount rate, a series of cash flows, and a series of corresponding dates for each cash flow. In valuing a security, investment, or company, the XNPV function provides a more accurate net present value because it factors in the time value of money,Time Value of MoneyThe time value of money is a basic financial concept that holds that money in the present is worth more than the same sum of money to be received in the future. This is true because money that you have right now can be invested and earn a return, thus creating a larger amount of money in the future. (Also, with future while NPV function does not. 7. How do you forecast free cash flow? Free cash flow to the firmUnlevered Free Cash FlowUnlevered Free Cash Flow is a theoretical cash flow figure for a business, assuming the company is completely debt free with no interest expense. It's used in financial modeling to calculate a company's enterprise value. The formula = EBIT - Taxes + Depreciation & Amortization - Capex – Change in Working Capital (a.k.a. “unlevered free cash flow”) is the preferred approach when valuing equities using the DCF method. You can also calculate the free cash flow to equityFree Cash Flow to Equity (FCFE)Free cash flow to equity (FCFE) is the amount of cash a business generates that is available to be potentially distributed to shareholders. It is calculated as Cash from Operations less Capital Expenditures. This guide will provide a detailed explanation of why it’s important and how to calculate it and several, which is the amount of cash available to equity investors after paying off debt, interest, and investment required to keep the company operating. 8. 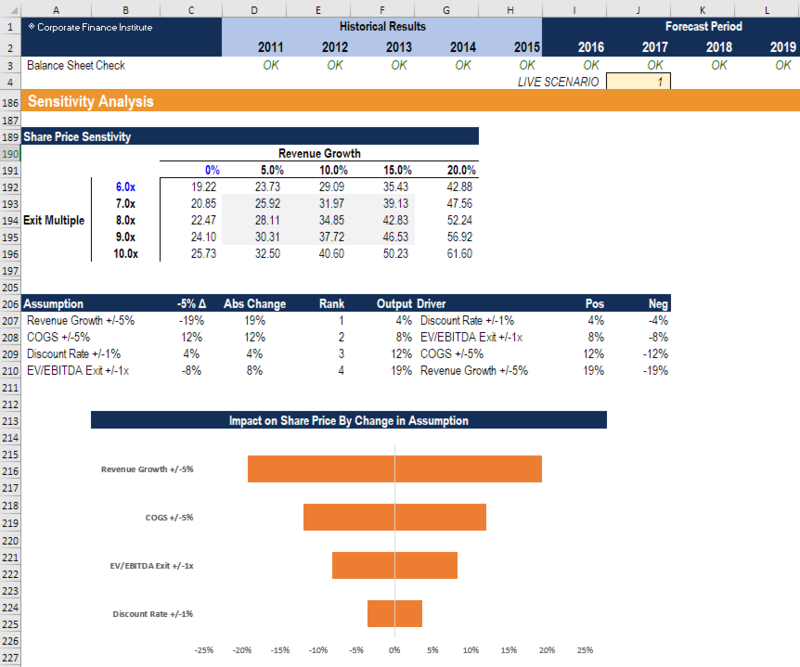 What is sensitivity analysis and how would you perform one in Excel? Sensitivity analysis is a tool used in financial modeling to analyze how different values of a set of independent variables impact a specific dependent variable under certain conditions. For example, a financial analyst may want to examine how a company’s profit margin may be impacted when variables such as the cost of goods sold and labor costs change. He can perform a sensitivity analysis to test different sets of values for these variables and see how the profit margin changes accordingly. One of the most useful tools in Excel for performing sensitivity analysis is the data tables, where you can show the output sensitivity by changing up to two independent variables. Tornado charts are also a great way of showing the impact of changes to many variables at once. 9. How are the three Financial Statements linked? 10. How can you make sure your numbers in a financial model are right? What tools in Excel would you use to audit your model? #1 Model structure — By separating inputs (constants only) from processing and outputs (formulas only), you can easily track the source of inputs and ensure that assumptions are consistent (assumptions should be entered once only). #2 Go to special — The Go to special function in Excel allows you to highlight cells containing specific content, such as constants, formulas, and text. This helps you check whether all inputs are constants and all outputs are formulas. #3 Trace precedents and dependents — Tracing precedents identifies what precedes the cell you would like to check (i.e., check which inputs are used in a formula) while tracing dependents identifies where an input cell flows into (i.e., which formulas use that input). Thank you for reading CFI’s guide to financial modeling interview questions and answers. We’ve also published numerous other interview guides. The best way to be good at interviews is to practice, so we recommend reading the most common questions and answers below to be sure you’re prepared for anything!